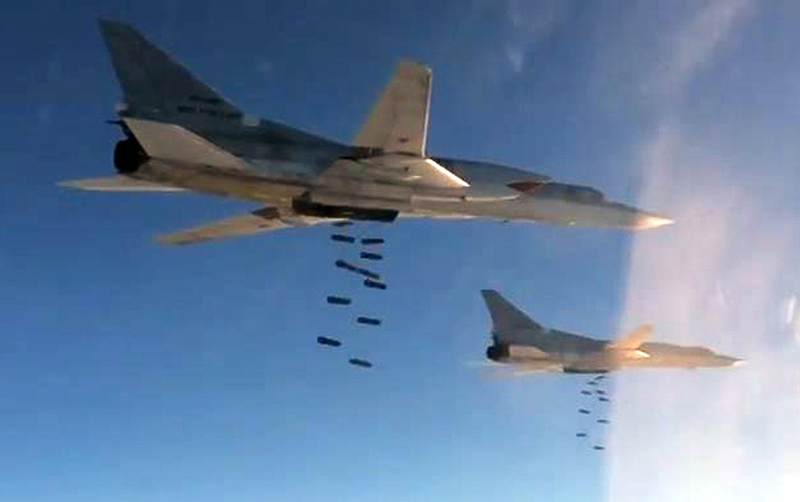 Six long-range Tu-22M3 bombers of Russia’s Aerospace Forces used high-explosive ammunition to hit terrorist facilities in Syria in the morning of July 12. Russia has used Tu-22M3 strategic bombers in Syria after a series of defeats by the Syrian National Army, military experts say. The Russian Aerospace Forces have used Tu-22M3 strategic bombers in the fight against Islamic State militants for the first time since a ceasefire was declared in Syria earlier this year. "On July 12, six Tu-22M3 long-range bombers, which took off from the home airfield in the territory of the Russian Federation, carried out a concentrated attack with high-explosive fragmentation projectiles against ISIS targets in the area east of Palmyra, Es-Suhne and Arak," the Russian Ministry of Defense said in a statement. The militant’s major field camp and three warehouses filled with arms and ammunition were destroyed in the attack. According to Ministry of Defense intelligence ISIS also lost three tanks, four infantry fighting vehicles and eight armored vehicles. According to Dmitry Safonov, the Izvestia daily newspaper's military correspondent, the situation in the Palmyra area had gotten out of the Syrian Army's control. "The troops have suffered a series of defeats and ISIS militants mounted a full-scale offensive," Safonov said. "Therefore, it took the additional involvement of the Russian military." According to the analyst, at some point in the Syrian operation, Russia was able to stabilize the situation and allow the Syrian Army to take the offensive. "We [Russia] have destroyed the ISIS infrastructure, leaving militants with no possibility for maneuver," Safonov said. "But after that, Russia withdrew some of its aircraft and reduced the intensity of attacks against terrorists. This allowed militants to regroup and regain the initiative." After recent defeats of government troops, the Russian Aerospace Forces will increase the number of combat missions, Safonov said. "In particular, the flights of strategic aircraft from the territory of Russia will be continued. However, Moscow will not send the main contingent back to Syria." According to an RBTH source in the Russian Ministry of Defense, each of the six Tu-22M3s was carrying eight tons of weapons onboard during the operation. The aircraft took off from the airfield in the town of Mozdok (1,070 miles south of Moscow) and flew over the Caspian Sea, Iran and Iraq. The Russian Aerospace Forces' long-range aircraft was first used in mid-November 2015, when law enforcement leaders reported on the involvement of Islamic State militants in the destruction of the Russian passenger airliner Airbus A321. The media earlier reported that the long-range aircraft strikes were to avenge the recent killing of Russian pilots near Palmyra. On July 8, Islamic State militants managed to break through the Syrian Army's cordon near Palmyra and began to advance toward the historical part of the city. Why is Russia changing the commander of the Syrian operation? Russian helicopters, which were flying over Homs Province at the time, received a report about the advance of the militants and were deployed to the theater of military operations. The militants’ further progress was halted, but in the course of the battle, ISIS soldiers shot down a Mi-25, an export version of the Mi-24 helicopter. The helicopter's crew was killed. However, Dmitry Peskov, the press secretary for the Russian president, said that the long-range aircraft's mission was a scheduled operation by the Ministry of Defense. "All this [the Tu-22M3s' strikes] is being carried out in the framework of the Russian Aerospace Forces' ongoing operation," Peskov said in an interview with the Interfax news agency. Safonov told RBTH that the military’s mission is not to take revenge, but to solve global problems. "Today, the task is to allow the Syrian Army to continue fighting after losses," he said.